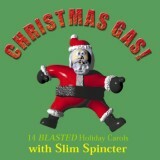 It's beginning to smell a lot like Christmas...thanks to Slim Spincter! Slim brings you 14 "blasted" holiday carols performed on the Spincterfone, a unique instrument that sounds like Santa after six bean burritos. Guaranteed to clear out any holiday party! Now featuring Scratch 'n Sniff accompaniment, available only with genuine Slim Spincter CDs! Sample some Slim Spincter! Click on song titles to listen to song clips (mp3 format). All orders will be shipped via U.S. Postal Service, Priority Mail with Delivery Confirmation. Shipping/handling charges are $4.00 per item. "Amazingly funny, and I don't know why..."
"It is a breath of stale air." "But for true gross-out goodness, there's nothing like Slim Sphincter's flatulent rendition of the Christmas classics, including an inspired version of "Silent (but Deadly) Night." "Slim, take your versions of Brownsleeves, Jingle Bells (something smells), and Silent (but deadly) Night, wrap them neatly up in a presentation box, and show them up your bum." Website ©2000-2007 Chris Leighton (the flatulent fartiste behind Slim Spincter). All rights reserved. All farts recycled.